The town is Crawley has a long-standing history, however also popular today for its central location to the airport and transport into London. Crawley however has a warm and friendly community, and with the help of the Crawley Borough Council, each year we have a warm and exciting festival which celebrates various talent. We has been exhibiting for number of years, each year attracting younger audiences from as little as 5 years of age. The team are in place to make the experience as comfortable and rewarding as possible, by observing and teaching young children’s how to DJ. Not forgetting the parents getting involved in the action too! We play a diverse mix of music and ensure everyone is given the opportunity to showcase his or her talent or to learn a new talent. 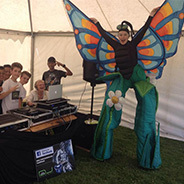 DJing at Crawley festival has inspired young children’s to pick up soft skills and help spread the word of to encourage today’s youths to learn new skills by attending our many workshops. Whether you DJ in a club, school disco, anniversary, wedding or 60th birthday party it is vital that you play to your audience. It is difficult to judge what type of music they might like so it’s always best to ask prior your gig to ensure you make your customer happy. Here are a few examples: – If it is a wedding or party, do they want specific songs for a special occasion? For example, at a birthday or engagement party, you could play “congratulations or celebrations by Cliff Richard”. Depending on where you might be playing its always best to ask your client if they are okay with music with swear words or has offensive lyrics. E.g. You might be at an event with children and play a song with multiple swear words in them which could lead to your client not being very pleased which is exactly what you don’t want. Another way you can play to your audience is by judging crowd reactions on the night. A good DJ will never have a dance floor empty. You can judge what type of music you should play by watching what your audience does. We’ve all heard a song and exclaimed what a great tune it is. This is exactly the same when you are a DJ. If you play songs and your audience has a positive reaction to it by shouting or dancing, then you are playing the right type of songs. On the contrary, if you play a song and you hear collective groans or the dance floor empties then you know you’re playing the wrong kind of music. Don’t worry if this happens, this has happened to every DJ. You can test your crowd by mixing a song and seeing what the reaction is. If the reaction is negative, don’t continue with your mix. Find another song to mix into. The key is to keep the dance floor busy. If a certain genre of music is working then stick with it. Even if you don’t like it you must play what the audience wants. You are being paid by your client to entertain the audience, not yourself. You can play whatever you like in your own time or at your own party. 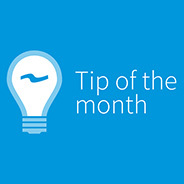 That is our DJ tip of the month. Come back next month for more advice. 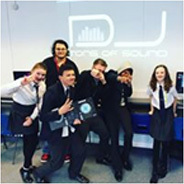 In 2015 we pilot tested a new school DJ project as there head of music wanted to introduce a new electronic based musical skill. Our team put our heads together and came up with a fully immersive course, which would fit in, to a school that included being fun as well as educational. We invested in new equipment for this project including 3 additional decks, laptops, speakers. An exam was created especially for this project so the young people can show they have learnt the theory elements of DJin as well as the practical. it would also benefit the school as they could see what the young people have learnt. We had a variety of abilities join us at this project, some people who had never seen a pair of DJ decks before and we had one or two people who already had good experience of DJing. 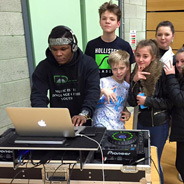 To help the young people develop certain skills, we let them dictate and plan the final event. This included event planning and dedicated jobs with large responsibility e.g. leader, stage manager, designers, and decorators. This would help develop their leadership skills as well as their creativity and ability to solve problems. During the twelve weeks, we would save some time at the end of the session to develop their responsibilities. They took to those tasks very well and we had everything set up for the final event. It was decided to host the event in the dance studio at the school so we can use a smoke machine for better effects with the lights. Our first ever final event went down an absolute treat. The young people were excellent and arrived on time to set up, complete sound checks, and put on their final performance. They each put on a fifteen-minute set and set their mark to friends and family. We will continue to work with the school and develop the workshops to their young people every. There are a number of young people who hang around on the streets with nothing to do. Due to this the council have set up a youth club so the young people have a safe place to go. 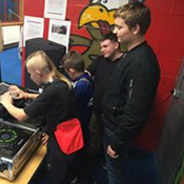 We have been commissioned by their local team to deliver DJ Projects over the last few years to engage with young people and teach them new skills. We have now delivered a number successful DJ projects since 2014. The young people were challenging to get actively involved in the project. However, with dedication we were able to gain their trust and encourage them to have a go, which many of them loved and lead with them having a longer go and coming back for more in future weeks working towards their final event. This meant that with all the DJ skills they had picked up over the twelve weeks, they would put on their own event for their family and friends, which they would organise. The young people prepared their sets over the twelve weeks ready for their final event. They put on an excellent show and entertained their friends. It is great to see new faces at the new projects as well as existing young people. We also have started DJ workshops at a girls group. They have currently re-booked our “silver package” ensuring we teach people of all ages, genders and abilities.